Wanted: A rotationally symmetrical Figure-eight knot with Face Centered Cubic lattice construction. The goal of the July 2018 contest is to make a Figure Eight Knot in the same cubic structure used in Mathnetism’s Trefoil Knot. Historically, most monthly Zen Contests involve many submissions, a fixed deadline, public voting, and multiple winners. We’ll generally continue that format moving forward, but neither of the two re-launch contests will work that way. This contest is over once the object is successfully made, or the contest continues indefinitely. Similar to the Non-Circular Planetary Gear and Gyroid contest, we have a feeling it’s possible, but we’re not sure and therefore there is no deadline. The bounty will increase by $50 each month, up to a maximum of $1000 on March 2020. Your peers will not be the judges in this contest. In knot theory, the figure-eight knot has the third-smallest possible crossing number, behind the trefoil knot with three crossings, and open loop with zero crossings. And while the trefoil knot shown has 3-fold symmetry (it would be the same shape if you rotated it 120 degrees), the figure-eight knot shown has 2-fold symmetry (it would the same shape if you flipped the left to the right.) Order-2 rotational symmetry is a contest requirement. The Face Centered Cubic (FCC) lattice structure is the same atomic structure found in aluminum, copper, and gold: atoms are located at each of the corners and centers of all cubic faces. 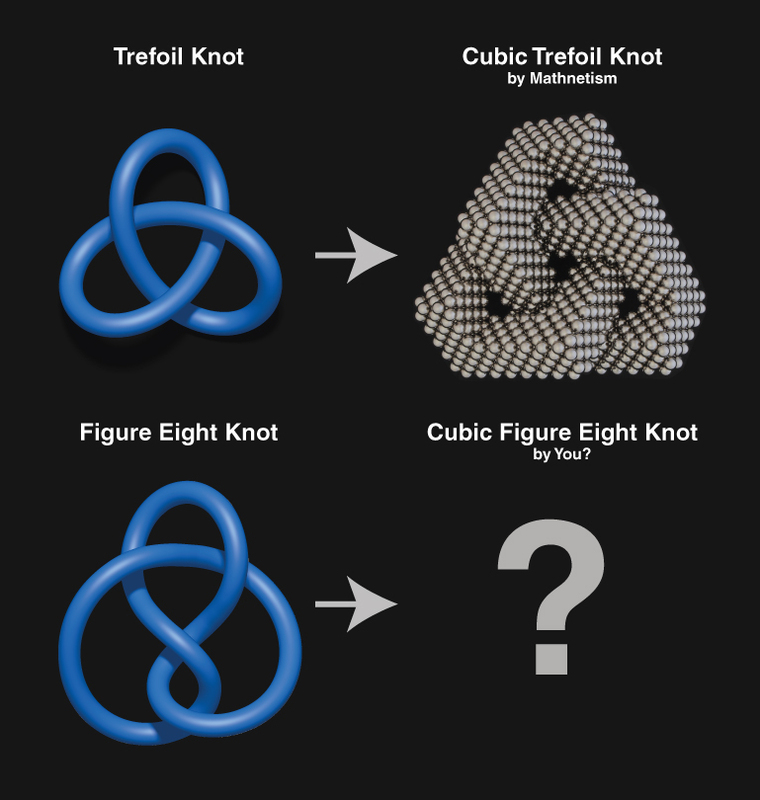 If you’re not familiar with building FCC lattice structures, we recommend going through Mathnetism’s actual Trefoil Knot tutorial, which takes about two hours at 1845 magnets to complete. Though the lattice must be FCC, your knot doesn’t need to bend at 90 degree angles like Mathnetism’s Trefoil Knot. For example, this Caduceus sculpture is also made from a FCC lattice. Similar to the Non-Circular Planetary Gear contest of 2014, your peers will not be the judges in this contest. If you think you’ve figured out how to create a Cubic Figure-eight knot, tell us via email with “Contest 56 Entry” in the subject line. We’ll reproduce your work to confirm it’s legitimacy. If you’re the genius that is able to complete this contest, your bounty will paid once we are able to successfully recreate your design. Zen Magnets Only. Use however many as needed. As always, everything you submit goes into the public domain. Of course the first and foremost requirement is that you have fun!